Previous Post Yeah, it’s time. Yay science! I hope they figure it out! Good luck tonight! I’m the world’s best sleeper – it’s my greatest talent – and I really can’t imagine how awful sleep deprivation would be. I hope you get some relief. 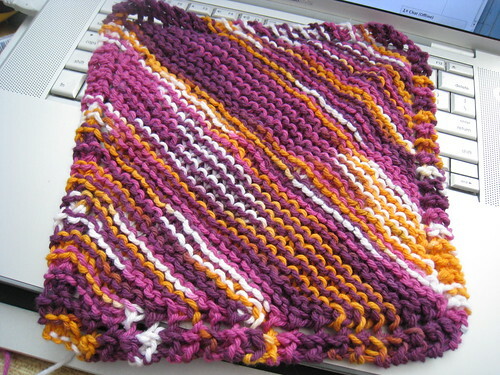 And the dishcloth is cute too! Here is a great website if you ever want to try different dishcloths. http://www.knittingpatterncentral.com/directory/dishcloths.php I use it when I want to make special dishcloths for wedding gifts. I love working with different colourways as well, I picked up 3 when I was shopping the other day just because I liked the colours. Good luck with your sleep study.